We exist to develop professionals who help ease human suffering, respond to emergencies, and increase global security. The active participation of our graduate students and or faculty with community partners is a primary focus of the HSEC Program. Therefore, the program has established a number of collaborative relationships with public, private, and non-profit sector partners on the international, federal, state, and local levels. These relationships are evident in both the classroom and through the HSEC Program’s research initiatives and they allow the homeland security graduate student to engage in a number of service-learning opportunities that make a real-world difference to the safety and security of people and communities around the world. The HSEC Program provides an intellectually and professionally vibrant educational environment that welcomes students with a strong desire to engage in interdisciplinary study, critical thinking, and research. Our alumni are found in the public, private, and non-profit sectors in diverse career fields such as humanitarian assistance, the military, public health, public safety, science and technology, intelligence, emergency management and response, higher education, information decision systems, project management, journalism, public administration, and politics. Many continue to be an active part of the HSEC Program after graduation, providing networking and job opportunities for current students and over 1000 alumni working at hundreds of companies and careers. 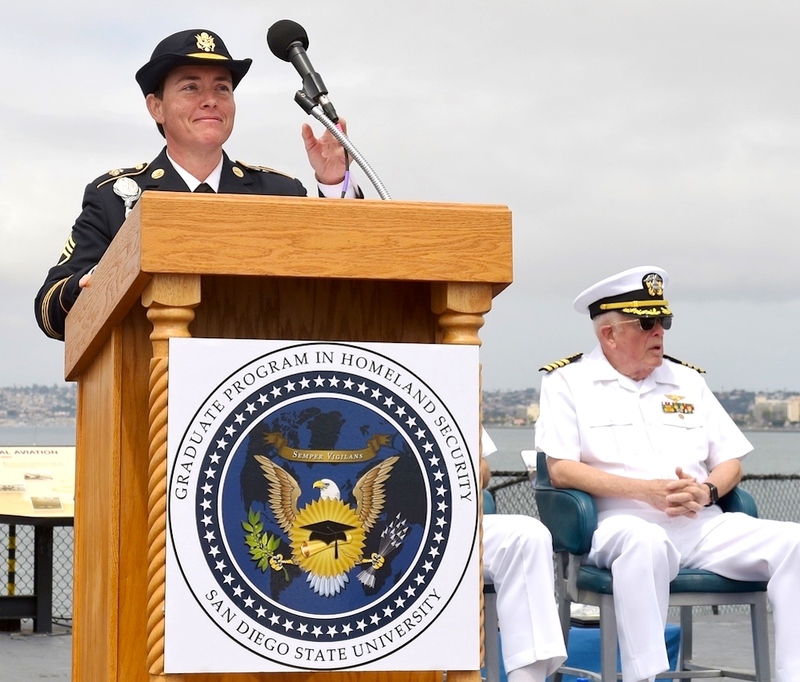 The SDSU Graduate Program in Homeland Security provides a learning environment where scholarly, educational, and research endeavors are applied to real-world challenges. HSEC Faculty strive to link classroom learning with real-world service opportunities. All of our students experience an internship, work experience, or fellowship in diverse areas such as emergency response through the Red Cross Disaster Worker and Duty Officer assignments, summer work experiences in law enforcement or the intelligence community, or realize new pathways in already existing professional careers. The SDSU HSEC MS program has proudly served in response to critical incidents and crises on the local, national, and global levels. The best part of our program is the body of people involved. This program is part of a vast global network which seeks to eliminate threats to human well-being and safety by not only stopping terrorist and organized crime networks, but also by working to improve the daily living conditions and opportunities of all human beings, locally, and globally. We invite you to explore our program, our process, and our people.